Here are some newsy tidbits about national and local media. Hope you like reading news about news! • Media company Tronc, which evolved from the Chicago Tribune media company, is selling its asset the Los Angeles Times to Patrick Soon-Shiong, an LA-based billionaire in biotech and a Tronc shareholder. The sale comes after a long period of turmoil at the LA Times, whose workers voted to form a union in January; Soon-Shiong is also purchasing the affiliated San Diego Union-Tribune as part of the $500 million deal. The Washington Post and, naturally, the LA Times have more on the story. • After the sudden shutdown of the Gothamist and DNAinfo websites, some Chicago-based DNAinfo editors have started a nonprofit news company called Block Club Chicago. They’ve launched a Kickstarter campaign which almost immediately exceeded its $25,000 goal; their coverage will be neighborhood-based, a gap that no other Chicago media company is currently addressing. More info and updates are on the Kickstarter site; the campaign’s success suggests fundraising may be a viable way forward for hyperlocal nonprofit news. • The New York Times has an interview with its own assistant managing editor, Monica Drake, who became the first African American woman to ever appear the Gray Lady's print masthead. That was in December 2017, which is not very long ago. • On a more local level, Mercury news reporter Doug Brown filed his last story with us this week. You can read it today: "The Scorpion" details the rise and fall of an Oregon-based diet supplement seller, and the FBI sting operation (get it? sting?? because he was called the Scorpion???) to bring him down. • Also! The Mercury appears in the background of a crappy new HBO show. That is not really news or anything, just something kinda weird. 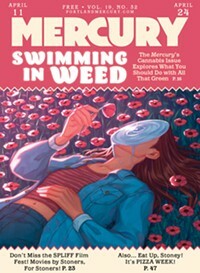 • Sources inform the Mercury that Willamette Week arts and culture editor Martin Cizmar will be leaving Portland later this month to take a job with Washington, DC-based Raw Story, an online media organization that focuses on political and economic news. Cizmar has been with Willamette Week since 2011; the arts and culture editor position will be temporarily filled by WW’s current music editor, Matt Singer. • Lastly, the Association for Alternative Newsmedia is holding its 2018 AAN Digital Conference in Portland for the second time in two years. The conference goes down February 22-24, so if you see hordes of sweat-flecked, possibly intoxicated journalists roaming the streets later this month, please give them a wide berth.